In reaction to Obama’s strong words on climate change in his inaugural address yesterday, Stephanie Pappas of LiveScience followed up yesterday’s coverage of Obama and climate change with additional commentary from Beth Sawin and Travis Franck of Climate Interactive. President Barack Obama discussed the need to act on climate change in his inauguration address, highlighting previously stated intentions to make the issue a priority in his second term. In his speech, Obama tied failure to respond to climate change with a betrayal of future generations. Obama went on to cast green technology in a positive light, arguing that America “must claim its promise.” The message resonated with climate scientists and environmental groups. “I was reassured to see him reaffirm that facts matter, and that the science overwhelmingly indicates that climate change is not only real, but is already posing a serious threat to society,” Michael Mann, a climate scientist at Pennsylvania State University, told LiveScience. However, Mann said, the details of Obama’s climate policy still need to be fleshed out. Obama’s mention of the c-word is not the first time climate has made an appearance in an inaugural speech, but presidents rarely use the occasion to discuss the environment. In 2010, Obama made a passing reference to rolling back “the specter of a warming planet.” Former President Bill Clinton made one reference apiece to the need for a clean environment in his 1993 and 1997 inaugural speeches, but did not specifically mention global warming. 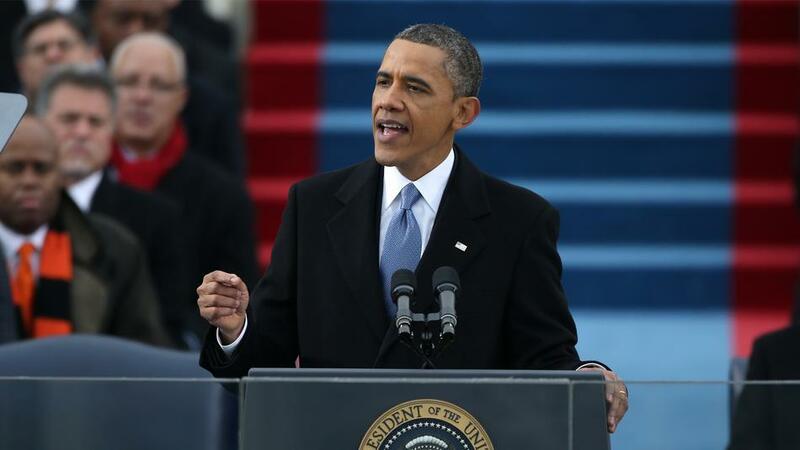 This year’s reference was much more extended than that in Obama’s first-term speech. Environmental groups praised Obama’s words and used the opportunity to push for policy action. But the action Obama intends to take remains unknown. Climate experts say that sweeping policies are unlikely to make it through Congress in Obama’s second term. The president does have some leeway to make regulatory changes via executive action. “It would have been much more encouraging if he went on to say that he would put the power of his office into the fight to get the country onto a sustainable energy path, by working for regulations and legislation that would incentivize energy efficiency and the transition to clean energy and make the burning of fossil fuels less attractive,” Elizabeth Sawin, the co-director of Climate Interactive, told LiveScience. “Citizens who care about clean energy and a livable planet are going to need to continue to organize and pressure elected officials, including the president, if we want to see concrete action and climate-protecting policy coming from Washington,” Sawin said.